Tuesday 25 March 2014 – Today, the Heritage Lottery Fund (HLF) announced support totalling almost £2.7million to help secure the futures of the Theatre Royal in Dumfries, St Cecilia’s Hall Edinburgh, Dunoon Burgh Hall, and Kirkcudbright Art Gallery. As well as restoring and altering the buildings to make them sustainable, work will be done to research and preserve the colourful histories of these creative and performing arts venues. Built in 1790, the Theatre Royal in Dumfries is Scotland’s oldest working theatre with links stretching back to Robert Burns, who helped finance its initial construction, and JM Barrie who was a regular attendee. HLF has awarded a grant of £322,300 for a project which aims to secure a sustainable future for the voluntary run theatre, as well as opening up its history to the public. Its vast collection of props, scripts, costumes and artefacts depicting 200 years’ of trends in drama, literature, fashion and set design will be used to tell its story through interpretation, exhibitions and outreach work. The theatre will be repaired and restored and the adjoining building converted to house new storage for the collections as well as an exhibition showcasing its history. There will be a new café and bar while an educational studio and digital media suite will be built as part of a wider educational programme to encourage people to engage with the history of live theatre in the town. One of the world’s finest collections of early musical instruments and the oldest purpose-built concert hall in Scotland (third oldest in the world) are to benefit from a £823,500 grant from HLF. St Cecilia’s Hall is set to become a centre for excellence for the display, study and performance of historic musical instruments. The project will display the University of Edinburgh’s collections of historic musical instruments under one roof. 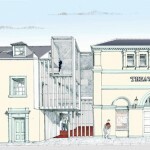 Designed and built in 1763 for the Edinburgh Musical Society, the building will be repaired and restored and given a new eye-catching entrance. Inside several flexible learning spaces will be created as well as glass-fronted conservation and teaching areas so that the public can view the work that is carried out there. A new gallery will allow this important collection, which includes harpsichords, virginals, spinets, organs, harps, lutes and guitars, some of which are over 400 years old, to be displayed and interpreted to modern standards. The main concert hall will be re-modelled closer to its original form and with improved acoustics so that audiences can enjoy regular performances of the instruments. Built in 1874 with funds raised by the people of Dunoon, Dunoon Burgh Hall was, for a time, the only theatre in Argyll providing the focus of public life in the town. It was saved from demolition in 2009 by the local community who brought it back into use as a performing and creative arts venue. A grant of £575,000 from HLF will restore and transform the building so that it has the facilities to offer a wider programme of events, performances and exhibitions. As part of the project, a programme of heritage activities will help record the history of the hall and there will be a wide range of learning opportunities associated with traditional building conservation. The Heritage Lottery Fund has given its initial support* for a £969,100 bid to transform the Town Hall In Kirkcudbright into a gallery of national significance showcasing the town’s artistic heritage – the town being one of only two recognised artist colonies in the UK. The project will save the Town Hall, which is currently at risk while also providing better access, care and interpretation to the Council’s collections of paintings, drawings, print-making, furniture, photographs and ceramics, including works by members of the Glasgow Boys and artists from the Scottish Colourist movement such as SJ Peploe. Professor Seona Reid CBE was welcomed today as a Trustee of the National Heritage Memorial Fund (NHMF) and Chair of the Heritage Lottery Fund’s (HLF) Committee for Scotland. Prof Reid has been appointed by the Prime Minister as Trustee with responsibility for Scotland on NHMF and HLF’s UK-wide Board, a role that brings with it responsibility for the Fund’s work across the whole for the UK as well as specific responsibility for leading the HLF Committee for Scotland. As Director of Glasgow School of Art for the past 12 years, Professor Reid will bring her considerable experience of the country’s arts and heritage sector to a Committee which is responsible for awarding grants of up to £1million to heritage projects across Scotland. Since its formation, HLF has invested over £500million in over 3,200 Scottish projects including the new Burns Museum and Riverside Museum of Transport. Professor Reid was appointed Director of Glasgow School of Art in 1999. She was previously Director of the Scottish Arts Council for 9 years, and before that Assistant Director (Strategy and Regional Development) of Greater London Arts, Director of Shape, Head of press and publicity, Ballet Rambert and Northern Dance Theatre, business manager, Lincoln Theatre Royal and a freelance arts consultant working with the Arts Council of Great Britain and the London Contemporary Dance Trust. She is currently on the Board of Cove Park Artists Retreat and a member of the Executive Committee Universities Scotland. She is a Fellow of the Royal Society of Art and was awarded a CBE in the 2008 New Year Honours for services to the Creative Industries. Professor Reid, who succeeds Dr Brian Lang, joins existing Committee Members Sheena Wurthmann, expert in biodiversity; Katrina Thomson, National Co-ordinator of the UK Joint Forum for Archives, Libraries and Museums; Ross Noble, former curator of the Highland Folk Museum; Willie Mcleod , past Director of Visitor Services & Quality at VisitScotland; Eleanor McAllister OBE Managing Director of urban regeneration company, Clydebank Re-built; and Ian Johnson expert in strategic planning and heritage management. Two very different historic buildings have been given lifelines today as the Heritage Lottery Fund announced grants for Linlithgow Burgh Halls and Coldingham Priory. Both projects are set to breathe new life into the built heritage and put them back at the heart of their communities. “I’m always heartened when new uses can be found for Scotland’s historic buildings. They give a community a sense of place, of history and of identity that cannot be replaced, yet without care and attention, they would eventually be lost. The Heritage Lottery Fund has awarded West Lothian Council a grant of £772,500 to transform Linlithgow Burgh Halls into a thriving community, tourist and arts centre. The Burgh Halls sit within an Outstanding Conservation Area which takes in Linlithgow Palace, St Michael’s Kirk and the Masonic Hall, but with deteriorating stonework, poor access and inadequate facilities, it remains largely unoccupied and vastly underused. Linlithgow Burgh Halls is made up of a two buildings – a 17th Century Town hall and a modest 19th Century wing to the rear with a linking area between the two. For 300 years they were the hub of town life. For 200 years they were the seat of justice where all accused were tried and, if guilty, imprisoned. They were also a place where the town could gather for public debate, for information and for entertainment. With the historic fabric of the building restored and a contemporary new interior, including gallery space, performance areas, function rooms, an education room and a cafe, the Burgh Halls are set to come to life again. The Tweed Forum has been awarded a grant of £237,500 from the Heritage Lottery Fund to conserve the ruins of Coldingham Priory and encourage community use of this fascinating site. The A listed ruins date from the 12th century although it traces its descent back to one of the oldest monastic foundations in Scotland founded in 643AD at nearby St Abbs Head and connected with Lindisfarne. It was part of Aidan’s mission spreading the Celtic strand of Christianity from Iona. Ebba the abbess was a princess and sister to Northumbrian kings. Her monastery was visited by St Cuthbert and recorded in Bede’s writings. The Norman foundation at Coldingham was an attempt to build on the links with the early Christians. The monks at Coldingham built a chapel on the cliffs at St Abbs Head in the 12th century and encouraged pilgrims to visit both priory and chapel. There are many colourful legends in the area. Today the ruins are in a very poor state, badly eroded, overgrown and at risk of collapse. With the help of Heritage Lottery funding the site will be rejuvenated: the ruins conserved, footpaths reinstated and a wasteland transformed into a community garden with a monastic theme concentrating on plants with culinary, medicinal, and aromatic properties. There will be interpretation for the first time explaining the hundreds of years of history contained within its walls while a year-long education programme will engage schools and community groups in many diverse activities relating to the Priory and its conservation. The Heritage Lottery Fund (HLF) enables communities to celebrate, look after and learn more about our diverse heritage. From our great museums and historic buildings to local parks and beauty spots or recording and celebrating traditions, customs and history, HLF grants open up our nation’s heritage for everyone to enjoy. To date it has invested over £480million in Scotland’s heritage. The National Heritage Memorial Fund (NHMF) is the fund of last resort for the nation’s heritage, coming to the rescue by funding emergency acquisitions. In 1994, the NHMF Trustees were also given the major task of distributing the heritage share of Lottery money for good causes, which it now operates through the Heritage Lottery Fund (HLF). This Fund was set up by Parliament in 1994 to give grants to a wide range of projects involving the local, regional and national heritage of the United Kingdom. HLF enables communities to celebrate, look after and learn more about the UK’s diverse heritage. HLF funds the entire spread of heritage, including buildings, museums, natural heritage and the heritage of cultural traditions and language. HLF has supported more than 30,000 projects, allocating over £4.5billion across the UK and has supported more than 3,200 projects allocating £500million across Scotland. NHMF has safeguarded a diverse range of over 1,200 iconic objects and places to the tune of over £300million. March 22, 2014 in Scotland.